BF-670 is a high technologic and biometric based identification that can not only works in the standalone mode without need of a host PC, but also easily integrate to PC by using TCP/IP. 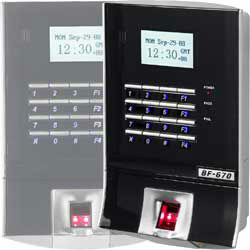 When BF-670 works in standalone mode, it's just like a single door access control system and provides unique master/slave function to control other BF-670. Besides this, it includes relay to control lock and auxiliary devices along with to exit input and door alarm input. BF-670 is physically stronger than other optic-based fingerprint recognition system in terms of shock-resistance, scratch-resistance, environment-resistance and etc. 1. Verification mode: 1:1, 1:N. 2. Verification time: less than 2.0 sec. 3. Registration time: less than 3.0 sec. 4. False rejection rate (FRR): less than 0.01%. 5. False acceptance rate (FAR): less than 0.001%. 6. Verification method: fingerprint, fingerprint + password, fingerprint + RFID, fingerprint + password + RFID. 7. Capacity: 4,500 persons (9,000 templates), 2 templates for 1 user. 8. Communication speed: 10/100M, auto crossing. 9. Communication: RS-485 → external reader & relay box (BF-20), TCP/IP → PC, RS-232 → dial-up modem or mini printer. 10. Log data: 65,000 event. 11. 16 DIO for system integration. 12. Keypad: 10 number key + 6 function key. 13. RFID function: build in RFID reader (EM/TM), MiFare (Optional). 14. 2 Relay output, one for doorlock, the other for ring 15. Size: 140 x 223 x 65 mm. 16. Display: 128 X 64 dots LCD, 3LED. 17. Power: DC 9-30V 1A.